Liberia stands out as the most forested country in West Africa. 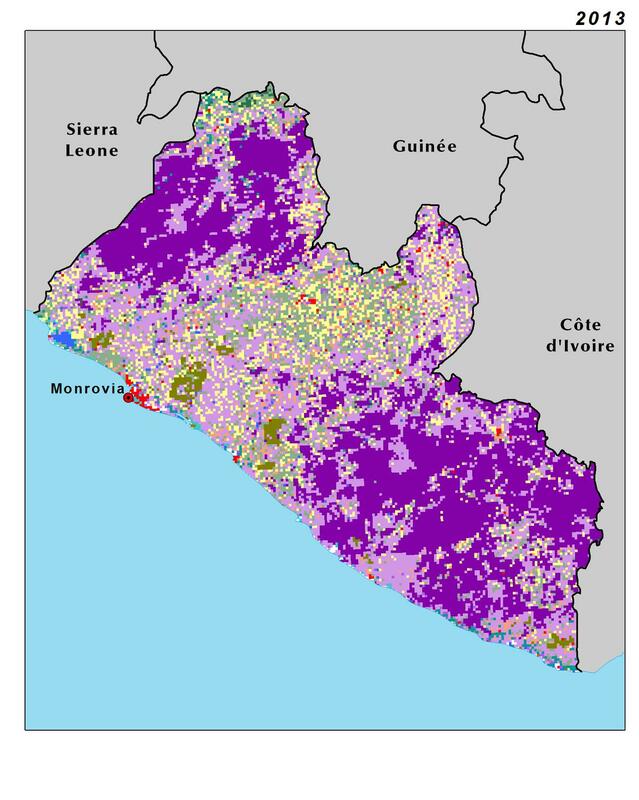 In 2013, forest covered two-thirds of Liberia’s land surface, of which less than half (44 percent) was mapped as degraded forest, followed by agriculture (13 percent of the land surface) and savanna (11 percent). Smaller land cover classes include thicket (3 percent), gallery forest (2 percent) and plantations (1.5 percent). 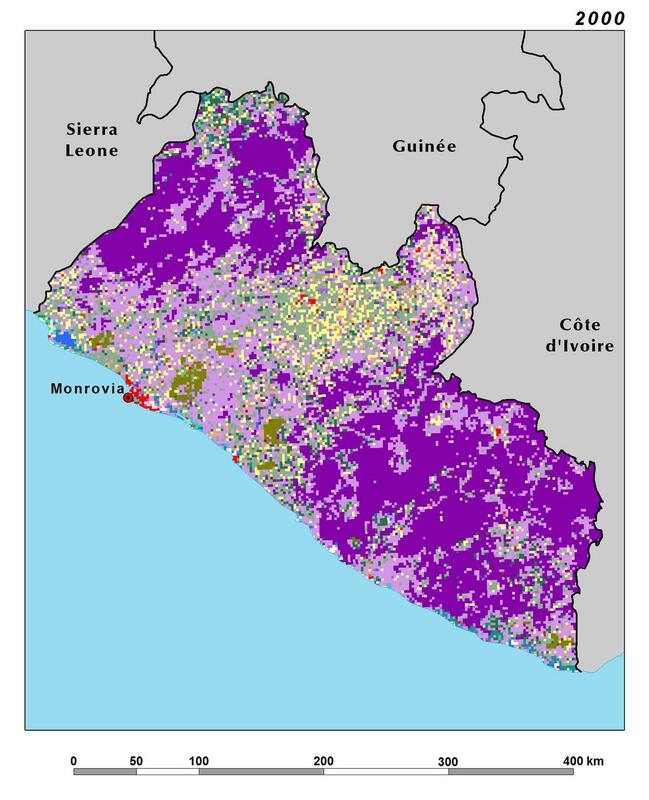 The remaining land cover classes each occupy less than 1 percent of Liberia’s land surface. The overall rate of change in land use and land cover has accelerated from 0.5 percent per year between 1975 and 2000 — slightly below regional average— to 1.3 percent per year between 2000 and 2013, which is above the regional average for this time period. While the civil wars (1989–1996 and 1999–2003) slowed down development and as a result land use change, the post-conflict years have seen a surge in land cover transformation. The most important trajectories of land use and land cover change have been associated with loss of forest cover: 3,000 sq km of forest were lost between 1975 and 2000, and another 3,500 sq km between 2000 and 2013, which represents an overall loss of 15 percent of the 1975 forest coverage. Most of the forest loss occurred in the eastern part of the country, in the Tropical Forest Zone (TFZ). Dense forest was mostly converted into degraded forest, savanna, agriculture and thicket, as a result of selective logging and slash-and-burn agriculture. Due to the highly dynamic nature of these land use strategies and the rapid re-growth of vegetation after clearing in this humid tropical environment, the land cover classes of agriculture, degraded forest and savanna show both gains and losses. On the other hand, dense forest, which takes the longest time to fully regenerate, has seen almost exclusively losses. While several of the smaller land cover classes have seen higher losses as a percentage of their 1975 coverage, the 15 percent loss of forest is by far the largest in terms of actual area lost (6,600 sq km) and is the most significant because of the importance of this remnant of Upper Guinean rain forest. Loss of woodlands has been even more dramatic, with a 98 percent loss since 1975, mostly replaced by thickets whose area has grown tenfold during the same time period. Since 2000, agriculture and irrigated agriculture have also expanded rapidly, along with agroforestry (plantations) and mining, all experiencing a revival since the end of Liberia’s civil war in 2003.